The Alert ship was built as a 12-gun cutter for the British Royal Navy in 1777. These were small, fast ships, with heavy armament and a large spread of canvas. They performed duties as revenue cutters, coastal patrols, dispatch vessels, and scouts. 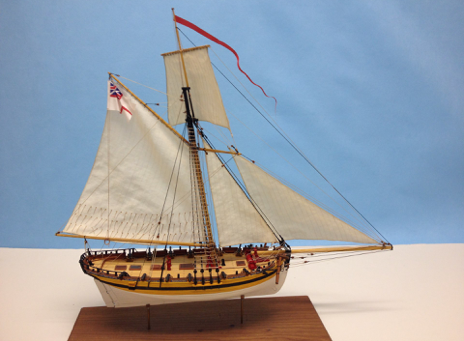 My HMS Alert is a 1/96-scale (1/8” = 1’) paper model built from a kit from the Polish manufacturer called Shipyard. This was my first foray into modeling in paper, and I found it both fun and challenging. Though a paper model, I chose to use other materials for certain features in order to get the best resulting model based on my skills. For this reason, the model might be better referred to as a multi-media model. For the masts, I used wood dowels. The cannons are aftermarket turned brass cannons that were just the right size (in reality, these were sold as 1/64-scale 1/2 pdr swivel guns, but they made perfect 1/96-scale 6 pdr carriage guns). Sails were cloth from a Shipyard accessory kit, and the blocks are aftermarket Swiss pear blocks that I had on hand. The hull, however, is all paper as built straight from the kit. An interesting feature of this particular line of ship model kits is that parts are pre-printed on standard paper. Not only do they have to be cut by hand, but most parts have to be thickened by laminating layers of paper or card stock. 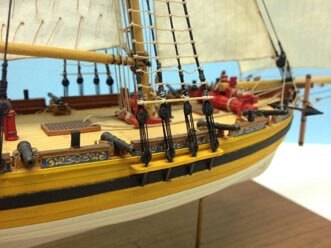 This particular model varies from most other paper model kits in that the hull is clinker-built or lapstraked. To get this effect, each hull plank has to be cut and applied separately, slightly overlapping the plank below. 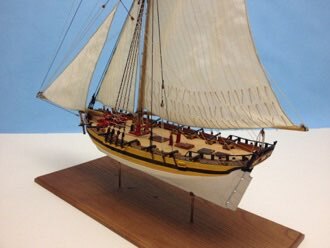 This is fairly unique in the Shipyard product line (the kit of the French lugger Le Coureur is the only other kit in the line that has this feature), and very rare among any ship model kits other than viking boat subjects. While the model came with pre-printed parts, I gave the hull and many of the deck details thin coats of paint, which probably adds to the illusion that the model is made from something other than paper. HMS Alert was a 10-gun cutter built for the British Royal Navy in 1777, and served during the American War of Independence. Cutters were small, fast ships. They performed duties as revenue cutters, coastal patrols, dispatch vessels, and scouts. My Alert is a 1/96-scale paper model that measures roughly 16.5” long and high.